Can You Lose Weight by Eating Six Boiled Eggs a Day? If you eat nothing but six boiled eggs a day, you'll lose weight, but you'll also put your health at risk. This is truly a fad diet; one that's so low in calories it doesn't provide enough energy to meet your body's basic needs, so it's not recommended. Plus, no one should eat six eggs each day because of the amount of cholesterol they would consume. Six boiled eggs contain 465 calories, which is way too few to sustain your health and energy. A woman's body needs a minimum of about 1,200 calories, while a man needs 1,600 calories daily to sustain basal metabolic needs. A diet that provides 800 calories or fewer daily is medically defined as a very low-calorie diet, or VLCD. Someone eating only six eggs a day would have to be closely supervised by a doctor, to monitor blood pressure, pulse and blood chemistry. Many patients following a VLCD diet obtain calories from shakes, nutrition bars or other products that are low in calories but provide essential nutrients. While a VLCD results in rapid weight loss -- about 3 to 5 pounds per week -- long-term results vary, and many people regain weight after they go back to a regular diet. In addition to being too low in energy, an egg-only diet would be risky because it's missing essential nutrients. Most people should not follow a VLCD, recommends the National Institute of Diabetes and Digestive and Kidney Diseases. A low-calorie diet is a better option because it allows a more reasonable number of calories daily, depending on your gender, age and activity level. Very low-calorie diets may cause fatigue, constipation or nausea, and it increases the risk for developing gallstones. You'll get barely a trace of carbs from six eggs. When carbs aren't consumed, the body burns fat for energy. This is called a ketogenic diet because fats are converted into ketones, which the brain and organs can use in place of glucose. A ketogenic diet isn't necessarily unhealthy -- as long as it's carefully designed to include sufficient calories and nutrients. It's not safe for everyone, however, and can cause side effects such as dehydration, constipation and kidney stones. Talk to your doctor before following a ketogenic diet. Six eggs contain 32 grams of total fat and 10 grams of saturated. The amount of cholesterol a person would consume from six boiled eggs -- 1,119 milligrams -- may be a problem, depending on overall health. Moderate egg consumption doesn't increase the risk of heart disease in healthy people, but it's best to eat no more than one egg daily, reports the Harvard School of Public Health. People with heart disease, high cholesterol and diabetes should limit egg consumption to no more than three yolks weekly. Protein is one of the benefits gained from eggs. They contain high-quality protein and a person would get 38 grams from six boiled eggs. That comes close to the recommended dietary allowance of 46 grams daily for women and 56 grams for men. While whole eggs are nutritious, even six of them won't provide 100 percent of the daily value for any vitamins or minerals except one -- selenium. 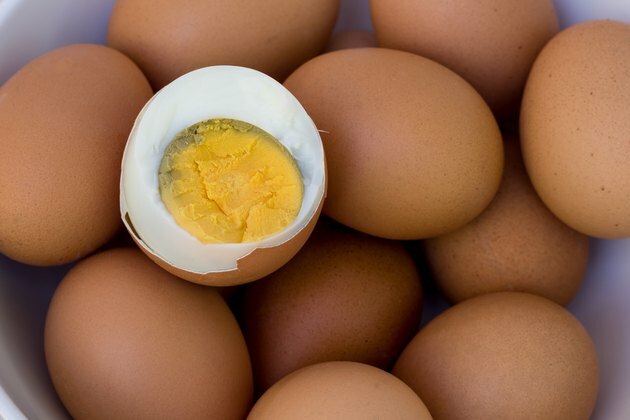 Six boiled eggs contain 56 percent of the daily value for vitamin B-12, 44 percent for vitamin D, over 30 percent for folate and vitamin A, and about 20 percent of iron, zinc and vitamin B-6. Taking a multivitamin can fill the gap and bring the daily value up to 100 percent for these nutrients, as well as the other B vitamins, vitamin E and calcium. But that still leaves a deficiency in key nutrients. There are three nutrients that six eggs don't contain: vitamin C, vitamin K and fiber. Multivitamins have the two vitamins, but they don't provide fiber. Another nutrient that's low in a six-egg diet is potassium. The eggs contain 378 milligrams of potassium, which falls short of the daily intake of 4,700 milligrams. Instead of eating only six boiled eggs per day, add other foods that serve double-duty by supplying several missing nutrients. Broccoli, cabbage, berries, leafy greens and beans are all good sources of fiber. Leafy greens, broccoli and cabbage provide vitamins C and K, while leafy greens and beans boost potassium intake. Berries are also good sources of vitamin C.
Berries and beans contribute essential carbs and calories, too. Boost carbs, calories, potassium and B vitamins with baked potatoes, sweet potatoes and bananas. Round out the weight-loss menu with whole grains, healthy unsaturated fats, more fruits and veggies, low-fat dairy and other lean proteins to fill in the nutrients needed by the body to stay healthy.